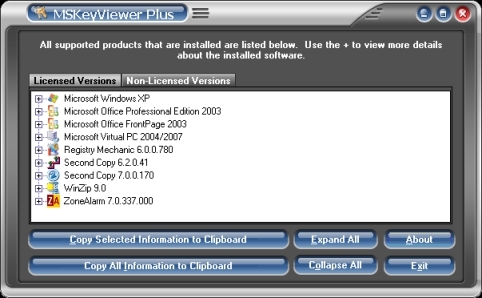 A program created to view program installation keys, service pack levels, and product IDs along with detecting many other non-licensed program versions. Works for most versions of Microsoft Windows, Office, Exchange, SQL Server, Norton AntiVirus 2004-2007, and more! 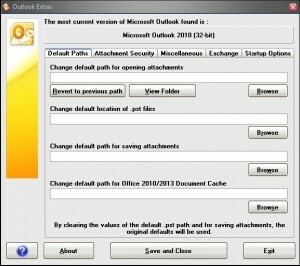 A complete list of supported programs is included in the About window of the program. You can download version 2.5.0 here. Fixes in version 2.5.0 : Exporting keys to a CSV will now store the computer name in the file for easier recognition. Rewrote detection code to work on Windows Server 2008/2012. Updated SQL Server key detections, removed older version detections for obsolete software. Added version detection for Box, Google Drive, Microsoft OneDrive, Notepad++, Libre Office, and Cisco AnyConnect. Fixes in version 2.3.5 : Office 2013 (32/64) detection fix. 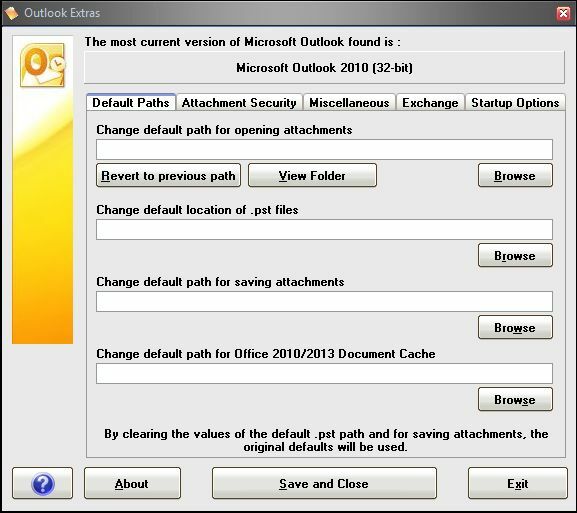 Support for Office 2010 SP2, AVG Free 2014, Microsoft Windows Defender for Windows 8.x, Adobe Flash Player (ActiveX and Plug-in installations). Fix for Foxit PDF Reader detection. Fixes in version 2.3.0 : Office 2013 (32/64) detection fixes. It seems that Microsoft has changed the key storage model for Office 2013 to resemble the same method as a volume license key with Windows 7/8. 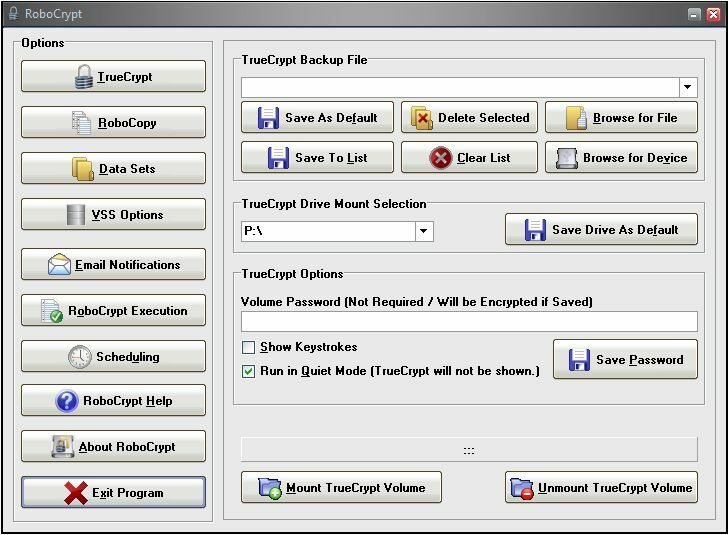 MSKVP should be able to extract the last 5-digits of an installation key but not a full installation key as in the past. Additional fixes : command-line fixes, GetRight key detection, KeePass, Acronis True Image (version only), VLC Media Player, Dropbox, Cisco IP Communicator, Cisco Jabber, and Juniper Networks Junos Pulse version detection. FOR A COMPLETE LIST OF SUPPORTED PRODUCTS DETECTED BY MSKEYVIEWER PLUS, PLEASE SEE THE ‘ABOUT’ SECTION FOR THE LISTS. To use the full functionality, please unzip all contents to the same directory. If you only want the English translation and no options, you can use the MSKeyViewerPlus.exe file to run on its own. NOTE: The .mlf files included are standard text files which can be opened using a text editor such as Notepad. If you would like to add a translation for your native language, simply copy the English.mlf file to something else (ie. Espanol.mlf), translate the text to the right of every ‘=’ symbol, and save the file. Also, please add your name and email address at the top of the file if you would like credit for it in the About window. 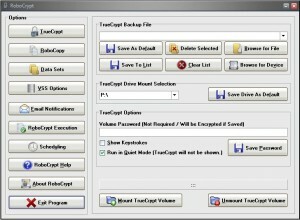 Once complete, restart the key viewer and your language should appear in the Options list. Please make sure that your language file is located in the same directory as the other language files. If you have developed a language file for this utility, please send it to me at ‘t k s h e r r e r @ i n a m e . c o m’ so that it can be included in future releases and others can benefit from the work! -nowarnings – With this used, no Windows warnings will appear. If a file is open, an error is written to the file. –Opens MSKeyViewer Plus with the remote registry for the computer ‘FileServer’. –Runs MSKeyViewer Plus silently with the remote registry for the computer ‘FileServer’ and writes the output to the file fskeys.txt. –Runs MSKeyViewer Plus silently with the remote registry for the computer ‘FileServer’ and writes the output to the file fskeys.csv with only licensed software listed. PLEASE NOTE THAT THIS FUNCTIONALITY SHOULD WORK FOR REMOTE 32-BIT SYSTEMS, BUT WILL NOT FUNCTION FOR REMOTE 64-BIT SYSTEMS DUE TO ARCHITECTURE CHANGES. THIS IS BEING LOOKED AT. 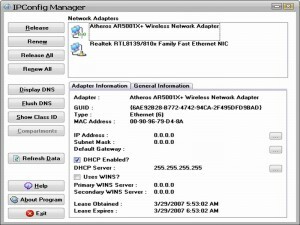 You must be connected to a remote machine with Administrator access to gather information from the registry. 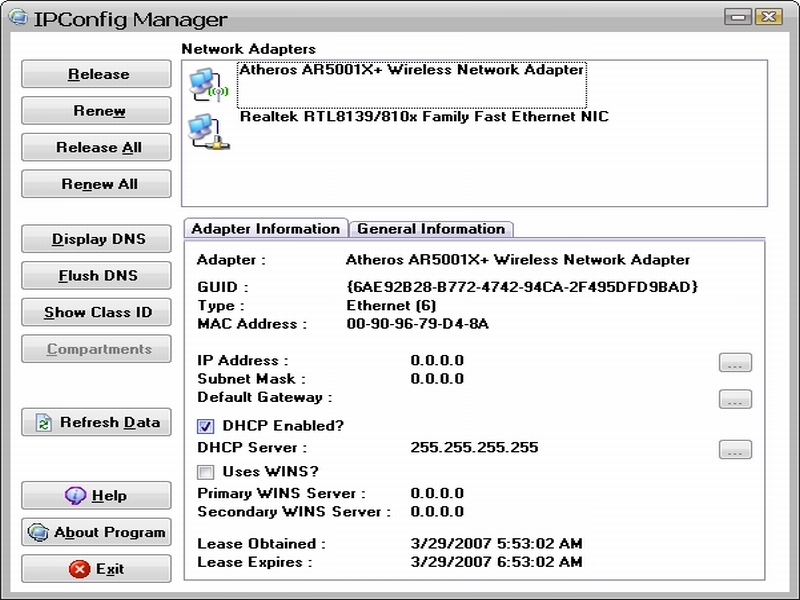 Remote registry access uses NetBIOS network traffic which may be blocked by local or network firewalls. For a Windows XP Workstation that is not joined to a domain, you must turn off ‘Simple File Sharing’. Windows Vista may not have the ‘Remote Registry’ service started by default. This service must be running. ** – With the installation of Registry Mechanic v6.0.0.780, the installation key is no longer available as a different, encrypted method has been used. For those who upgrade from an older version, you may still be able to see your key. For those with fresh installations of this new version and onwards, the key may not be shown. Download the previous version (v2.3.0) here. Download the previous version (v2.3.5) here. 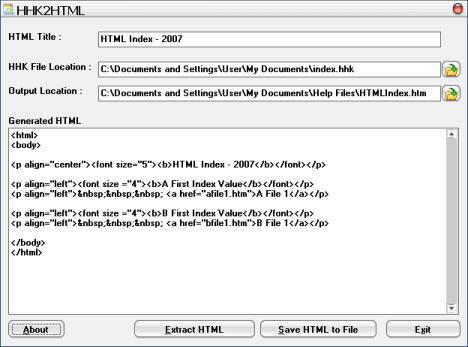 HHK2HTML is a simple utility to extract index links from a Windows-compiled help index file to a standard HTML file. The file extension of the compiled index file will be .hhk. This file contains an XML-like structure that can be read using a standard text editor. HHK2HTML scans these files and creates an HTML index based on the entries it finds. Created for Mac users who cannot access .chm compiled help files. To use this utility, locate the .hhk file, specify an output filename and location, enter a title for your HTML document, then click the ‘Extract HTML’ button. You can manually modify any HTML entries you see. Once complete, click the ‘Save HTML to File’ button, and your new index file will be created. You can download version 1.0 here. 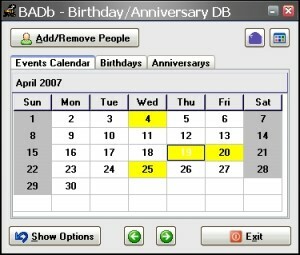 BADb (aka ‘Bad Bee’, aka Birthday/Anniversary Database) is a project of mine that has evolved out of another project to help to track birthdays and anniversaries for friends and family. This program will help you to store names along with spouse names, birthdates, and anniversary dates and also allow you to store email addresses to send an email to those who have a birthday or anniversary. 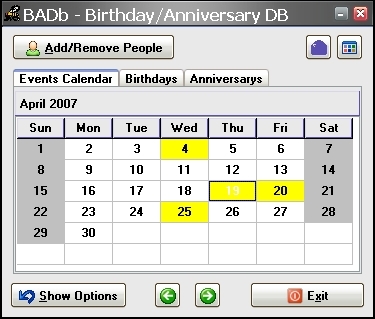 This program will run in the Windows Taskbar and it will notify you by color-coding dates if there is a birthday or anniversary on the current date. A list of these dates for the current month is shown so that you can plan ahead to celebrate these events. You can export/import your database to an Excel-based .csv file. A help file is provided to explain the features included with this program. You can download version 1.1 here. 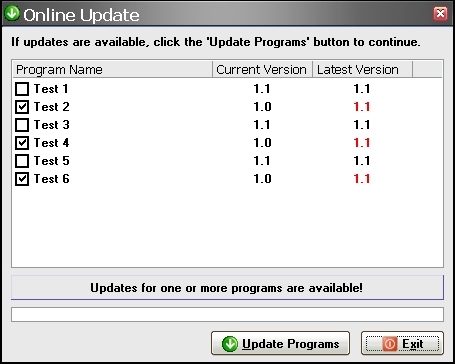 PRUpdate is a project designed for program developers to add the functionality to your program of updating files online. This program will do the work for you with a little setup of some configuration files and you only need to make a call to it from within your own program to launch an online updating utility. A help file with an example is provided in this download to get you started. You can download version 2.7 here. Changes in v2.7 : Added server side option to prevent a message from appearing if there is no update available. Changes in v2.6 : Added ability for PRUpdate to either gracefully or forcefully shut down a process that needs to be updated before updating continues. This feature will not work for items such as PDF or HTML help files as the loading application is not determined, but for main application executables, the processes can be closed to ensure that the updates are processed correctly. Right-clicking in the update file list will present ‘Select/Unselect All’ menu choices. A PRUWizard utility has been added to provide a graphical method for creating or modifying local or remote INI files for file updating. MD5 hashes can be calculated automatically using this wizard. Download previous version v2.6 here. Download previous version v2.5 here.